The feeling of excitement is what draws most individuals to become a Clip ‘n Climb standalone owner, while still feeling unsure as to whether they can make it a success. To alleviate those fears, we’ve gathered top tips from current owners to show how you can make a success of your future Clip ‘n Climb centre. Whether you plan to rent or purchase a building for your Clip ‘n Climb centre, the height of your building is essential in facilitating the challenges. The minimum height of our challenges is 6.4 metres (21 ft) and can be extended to a maximum of 10 metres (33 ft). A further 400 mm of height is required above each climbing challenge to allow for the inclusion of the steel belay bracket system. We have a dedicated team of engineers and project managers who will work with you to ensure the challenges will work within your chosen building. 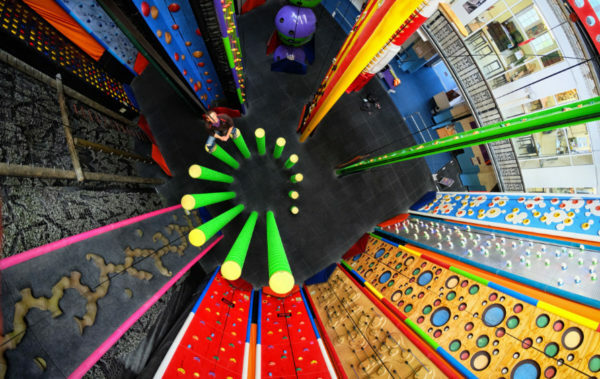 Clip ‘n Climb has more than 40 unique climbing challenges, available in a range of colours – this also includes our popular Leap of Faith and Vertical Drop Slide challenges. Most current owners cannot fit all of these challenges into the same building, so consider shortlisting your ‘favourite’ challenges, or, choosing challenges around a particular theme. It’s true that 87% of climbers that experience Clip ‘n Climb are between the ages of 4-16, but this doesn’t mean your venue should solely focus on children. 13% of climbers are aged 17+ and are taking part in corporate team building sessions and exercise classes. It should also be noted that 95% of the client base are spectators who come to support their friends and family. While they may not participate, they will be interested in your food and drink facilities – generating additional revenue for you. We recommend that there should be a minimum of two instructors in the Clip ‘n Climb arena at all times when there are climbers present. Clip ‘n Climb centres are extremely popular locations for birthday parties. In the first three years of opening, the centre in Exeter, UK, generated thousands of pounds in birthday parties alone. If you are planning to host parties, we recommend putting a space aside in your building for one party room for every 15 climbers. Parties guarantee a great source of additional revenue especially if you include catering options to make the party memorable. Get in contact with our team today to discuss how you can become a stand-alone owner and the next member of the Clip ‘n Climb family.